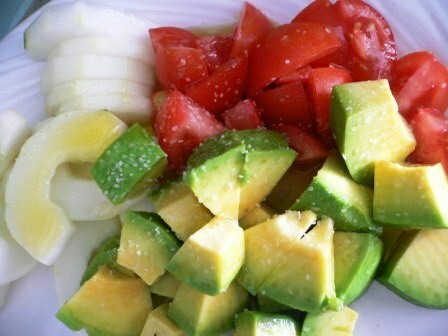 Tomatoes and avocado are the perfect compliment . . . for each other and for any meal. I like to slice a tomato and an avocado, sprinkle with olive oil and salt, and enjoy. Now, I am no health nut. 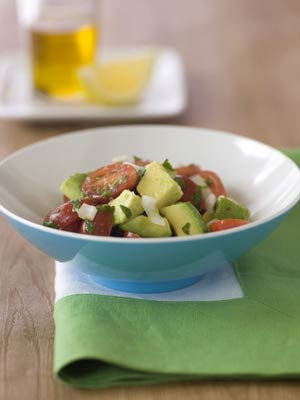 I love snickers and corn dogs, but nothing feels as clean and satisfying as a delicious tomato and avocado salad. (***I like grape tomotoes because they don't shoot/spray like cherry tomatoes.) Eat it plain, or dress it up ever-so-slightly with onions and cilantro, and you have a enjoyable (and aesthetically pleasing) salad. Toss together all ingredients. Chill 30 minutes and serve.